Liverpool produced arguably one of the greatest European comebacks of all time last night as they stunned Borussia Dortmund to win their Europa League quarter-final 5-4 on aggregate. The Reds brought a 1-1 first-leg draw with them back to Merseyside, but Dortmund stormed into a two-goal lead after nine minutes, and then again early in the second half after Divock Origi’s reply. But goals from Mamadou Sakho and Philippe Coutinho, and a stoppage-time winner Dejan Lovren, snatched Jurgen Klopp’s side a memorable triumph which will go down in the Europa League archives. The English champions shocked the mighty Real Madrid with a 4-1 win at the Baseball Ground in the first leg of their second-round tie, with Charlie George bagging a hat-trick. But it all changed in Spain. Real were only one up at half time, still needing three to win the tie. They got three, only for George to send the tie into extra time, where a Santillana goal made it 5-1 to Madrid and broke Derby hearts. Nearly 30 years later, Real were on the wrong side of a huge European comeback, and it was one of their own who inflicted it upon them as on-loan striker Fernando Morientes inspired a famous Monaco win. The Ligue 1 side trailed 4-2 from the first leg. At that point, Morientes’s away goal seemed irrelevant, but another in the second leg and two from Ludovic Guily sent Monaco through to the semi-finals. What is staggering is that Monaco’s was not the most extraordinary comeback of the 2003-04 Champions League quarter-finals, as Deportivo outdid them to shock defending champions AC Milan. The Spaniards were brushed aside 4-1 at the San Siro, but goals from Walter Pandiani, Juan Carlos Valeron, Albert Luque and Fran completed the second-leg comeback with 15 minutes to spare. The size of this comeback is not what makes it special. But, given the context, it must be considered one of the greatest in history as United scored twice in stoppage time to secure an historic 1999 treble. Bayern had led for 86 minutes through Mario Basler’s free-kick, and some United fans had given up only for Teddy Sheringham and Ole Gunnar Solskjaer goals from late corners to turn the game on its head. The miracle that probably inspired Liverpool’s comeback last night. In arguably the most dramatic Champions League final of all time, AC Milan led 3-0 at half-time after thoroughly outclassing the Reds. Step forward Steven Gerrard, who galvanised his side in Istanbul with Liverpool’s first goal. 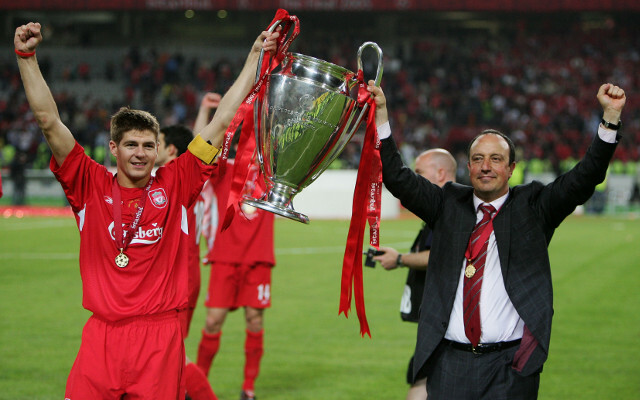 Vladimir Smicer fired in a second and Xabi Alonso sent the tie to extra time with a rebound from a penalty. Milan, comprising of some of the best Italian players of their generation as well as the likes of Kaka and Hernan Crespo, were shellshocked, and Jerzy Dudek saved Andriy Shevchenko spot kick in the penalty shootout to win Liverpool a fifth European Cup. Last night was special, but this will take some beating.